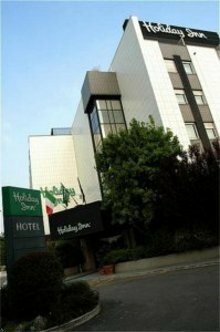 Holiday Inn Bologna Via Emilia is the nearest Holiday Inn to Bologna International Airport G. Marconi, just 3.5 km, also connected with public transportation bus line. Located at the entrance of city, easily reachable from highway A1. The hotel is at just 10 minutes drive from Bologna Exhibition centre (free shuttle for main exhibitions) and 7km from the Railway Station and Bologna downtown. For its strategical location, Holiday Inn Bologna Via Emilia hotel is the ideal place for business meetings: a modern congress centre with 4 meeting rooms up to 280 delegates, a large parking and a 24/24h guarded garage are at customers&reg disposal. Nearby public bus transportation to Bologna city centre. Bus running 15&reg &reg Taxi Fare aprox. 16,00 &reg WI-FI connection available in all guest rooms, meeting rooms, and public areas. Our Restaurant &regAlla Bell&regItalia&reg offers traditional Emilian cooking in very authentic Bolognese atmosphere, ideal for dinners or business lunches. Our Bar &regLa Terrazza&reg, with his long drinks and aperitifs, will make your stay even more pleasant.For those keen on motors, Holiday Inn Bologna Via Emilia is just at 900 m form Ducati and a strategic location for visiting Ferrari in Maranello, Maserati in Modena or Lamborghini. Pets Accepted , please call hotel in advance.